FTD® proudly presents the Better Homes and Gardens® Holiday Classics™ Centerpiece. Drawing from the rich traditions of holiday décor, this festive centerpiece is set to lend its seasonal beauty to your holiday celebrations. 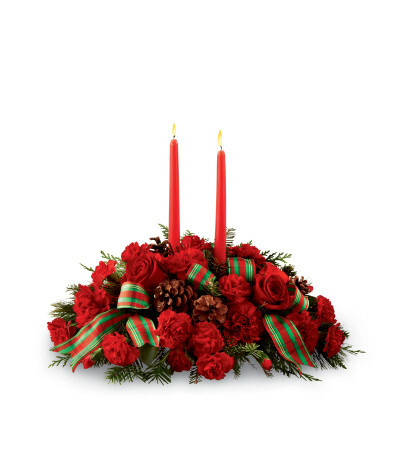 Bright red roses, carnations and mini carnations are arranged amongst an assortment of holiday greens, accented with natural pinecones, and a designer red and green striped ribbon. Encircling 2 red taper candles, this lovely centerpiece will bring warmth and Christmas charm to your holiday gatherings with each graceful bloom.